The Secretaries of Foreign Affairs and Finance awarded the banker for his work, professional career and commitment to Mexico. Gulliver said that Mexico's financial institutions are trusted to boost economic growth and investment. 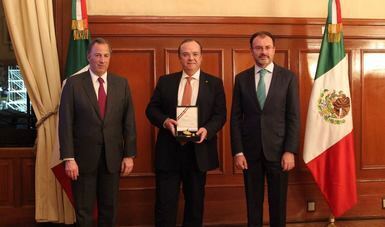 Foreign Secretary Luis Videgaray Caso and Finance Secretary José Antonio Meade decorated Stuart Gulliver, Group Chief Executive of HSBC Holdings, with the Mexican Order of the Aztec Eagle for his contribution to the national and international financial system. In a ceremony at the National Palace, Stuart Gulliver was recognized for his work in promoting the topic of sustainable finance within the financial system and for strengthening Mexico's position as a strategic country for the group he represents. Secretaries Videgaray and Meade agreed that Gulliver's work and leadership as Chief Executive of Global Banking and Markets at HSBC was key to the institution's stability during the 2008 global financial crisis. Its prudent capitalization and funding strategy, among other measures, enabled it to navigate the following years without a slowdown in its operations. HSBC was one of the few international banks that received no taxpayer money from any government to shore up its operations. Prior to the award ceremony, the Finance Secretary and Stuart Gulliver held a meeting during which they highlighted the strengths of the Mexican financial system and discussed the bank’s prospects in Mexico. Secretary Meade mentioned that Mexico has become a strategic country for the bank, and thanked HSBC Mexico for its solidarity with the Mexicans who suffered from the September earthquakes. Upon receiving the decoration, Gulliver said that Mexico's financial institutions are trusted to boost economic growth and investment. The Mexican Order of the Aztec Eagle is the highest distinction granted by Mexico to citizens of other countries in recognition of the important services they have rendered to the Mexican nation or to humanity. It is also a symbol of the roots, identity and strength of our nation.